When Boria Majumdar, the cricket expert (he has a PhD on history of cricket from Oxford!) was invited to give a talk at SAP Labs Gurgaon, little did anyone know that it will catalyze the first idea from India Lab to enter the game-changer funnel. Game-changer is a new business incubation process at SAP Labs where only 3 ideas enter every year each having a potential of generating at least $20M of annual revenue. Last Wednesday V. R. Ferose, MD of SAP Labs India, narrated this story in Bangalore Innovation Forum at IIMB while speaking on how SAP Labs India is building an environment of innovation. What’s cricket got to do with software products? Let’s look at the story in brief and related questions that came up during the Q&A session. When Ferose took over as MD at SAP Labs Gurgaon, he observed a fundamental issue with the environment. There were 500 smart employees with an average age of 26.5. However, they were surrounded by the same kind of people. Even outside the office they were mingling with their friends who were also from the same background i.e. IT. If one of the tenets of innovation is to “think different”, how can that happen when everybody thinks the same? Of course, one can’t control who one makes friends with. Then can we invite people with different background to the company and share their perspectives? That got a series of talks started where a non-IT person was invited every week for an hour. People who visited SAP Labs during this series are: Kiran Bedi, Dr. Abdul Kalam, Rahul Bose, Harsha Bhogle, Harish Hande etc. Boria Majumdar visited as part of this series. Boria spoke about the problems with cricket administration. He mentioned how corrupt the whole administration is and how there is a huge need for bringing in efficiency in sports administration perhaps through a software. One of the employees picked it up as a potential opportunity. During the market survey it was clear that if we take into account the cash rich sports clubs like English Premier League (EPL) then there is indeed a huge opportunity. Perhaps IPL belongs to the same category. The idea was taken further – relevant patents were filed. And the idea got selected to enter the global business incubator i.e. game-changer process. Q1: How did the idea author get rewarded in this case? The idea author gets recognition in two forms. The first is that he becomes part of the incubation team not necessarily as a leader to the take the idea further. It took one and a half year for the idea to be incubated. The second form of recognition is an option given of going for a week to a design school either at Stanford or in Berlin for a course on design thinking. Q2: Did $20 M goal act as a deterrent in submitting ideas? We realized that technology people are not good at creating a business case. We have a value engineering group who help pre-sales in creating value propositions for prospective customers. We got the good ideas from technology people validated from the value engineering folks. This brought out the business potential of the ideas. Q3: Have you come across an idea which started as incremental and then led to a disruptive innovation? I don’t know all the innovations that came out from SAP Labs. However, from my experience I haven’t seen any incremental idea becoming disruptive. Imagine you have got a game-changing idea. You prototype it in your spare time and the demo get appreciated by a few people including a VP and a product manager. Then comes your performance appraisal and your boss rates you “above average”. He tells you the reason for the “above” part of the rating – it is because you got the Six Sigma certificate during the appraisal period. He doesn’t mention anything about your idea. Sounds surprising? Well, what happened here is similar to what happened to Einstein at Swiss Patent Office. The game-changing idea was that of “Special theory of relativity” and the certificate was the PhD degree from University of Zurich. Let’s see how the story unfolded during Einstein's six year tenure at the patent office. In August 1900 Einstein was the only student among his friends to graduate and not get a job in spite of a respectable 4.91/6.00 average. He felt “I was suddenly abandoned by everyone standing at a loss on the threshold of life”. He had yet to publish any paper and had no credibility. After two short teaching stints in schools lasting a few months each, Einstein got called for an interview from Swiss Patent Office at Zurich in early 1902. In the interview “Albert was examined for two full hours. The director placed before him literature on new patents about which he was required to form immediate opinion. The examination unfortunately disclosed his obvious lack of technical training.” Einstein was offered a job in spite of the interview because of the good word put in by, his friend Marcel Grossman’s father Herr Grossman with the institute director Herr Friedrich Haller. The position offered, Technical Expert class III, was provisional and one level below what he was interviewed for i.e. Technical Expert class II and the salary was 3,500 francs a year. Einstein took up the job within a week of getting the formal letter sometime in the summer of 1902. It is interesting to note that in the 1906 appraisal, the director did not even mention the three papers the young employee had published in the single issue of Annalen der Physik in 1905, his annus mirabilis – one important enough to take him to the history books (on Brownian motion), one which brought him the Noble prize sixteen years later (on photoelectric effect) and the third containing the outline of Special Theory of Relativity. Moral of the story? If you have a game-changing idea, don’t expect to get “excellent” rating from your boss, at least not in the next appraisal cycle. Even by the turn of the decade (1910) there were only a handful of people in the world who had understood the impact of relativity. Einstein had to be extremely lucky to have a boss to be one of them. What did the patent office job mean to Einstein? 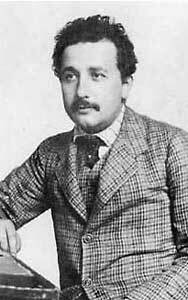 Three things: One – “Besides eight hours of work … eight hours of idleness plus a whole Sunday”, second, "He (Haller) taught me to express myself correctly", and third, what Einstein mentioned on his seventieth birthday, “It gave me the opportunity to think abut Physics. Moreover, a practical profession is a salvation for a man of my type; an academic career compels a young man to scientific production, and only strong characters can resist the temptation of superficial analysis”.